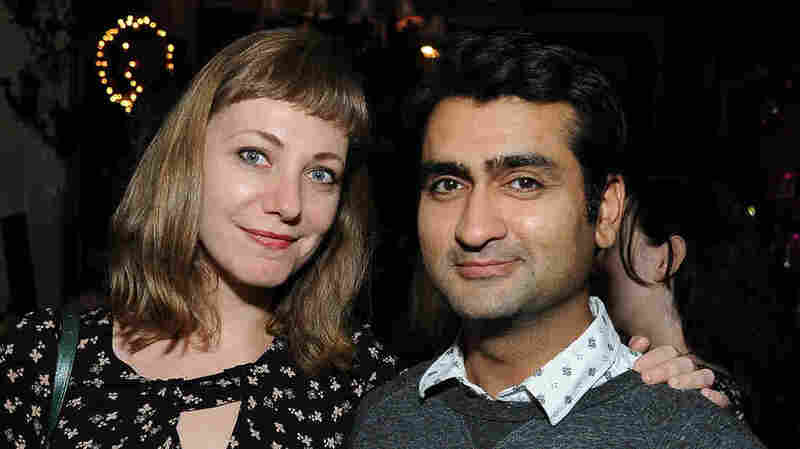 How A Medically Induced Coma Led To Love, Marriage And 'The Big Sick' Comic Kumail Nanjiani remembers the first time he thought of marrying then-girlfriend Emily V. Gordon: when he saw her in a coma. Now the couple has co-written a romantic comedy based on their story. Married co-writers Emily V. Gordon and Kumail Nanjiani based the romantic comedy The Big Sick on their own love story. It sounds like something dreamed up by a team of romantic comedy writers: A Pakistani-American comic falls in love with an American graduate student, but because of cultural pressures from his family, he is forced to keep the relationship a secret. It is only when she becomes mysteriously ill and is put into a medically induced coma that he decides to tell his family about the woman he loves. That is the plot of the new film The Big Sick, but it is also the story of how the film's co-writers, Kumail Nanjiani and Emily V. Gordon, met and fell in love in real life. Nanjiani, who also appears in HBO's Silicon Valley, stars as himself in The Big Sick. The role of Gordon is played by Zoe Kazan. Nanjiani, who plays himself in the film, says the days Gordon spent in a coma were pivotal to their relationship. "This sounds like a movie moment, but it really, really isn't. I remember seeing her laying there in the coma for the first time and I remember having the thought, If she comes out of this, I'm going to marry her." Gordon did come out of the coma, and she and Nanjiani married three months later. 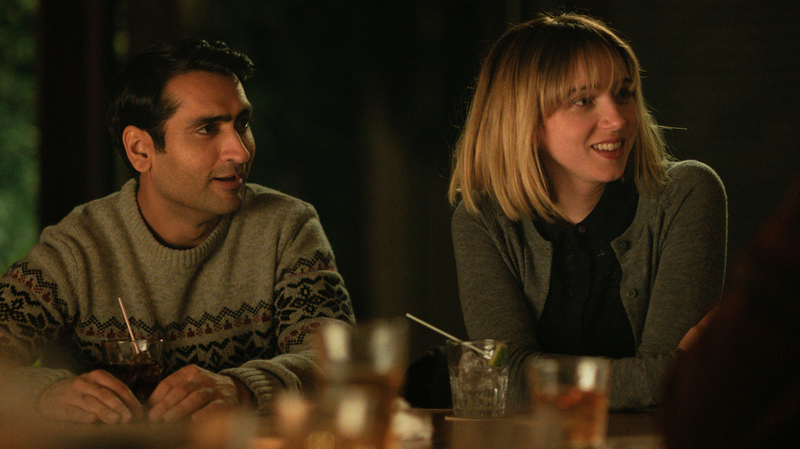 Though their story ended happily, Gordon (played in the film by Zoe Kazan) says both she and Nanjiani were careful about "not writing anything that felt disrespectful or off-base or off-color" for the screen adaptation of their story. "Because we had been through it ... we knew the emotional truth of what happened," she says. "And we knew that we didn't want to disrespect what actually happened and the seriousness of being in a medically induced coma." Emily V. Gordon: [Producer] Judd [Apatow] was really great about encouraging us to ... write the movie out, put everything out there. And [then] he was like, "Don't worry about the comedy, the comedy will come," which I think was really good advice. Kumail Nanjiani: Generally, comedy is a person in trouble; it's a person dealing with a situation that they're ill-equipped to handle. And we knew that the real-life event, no matter how traumatic, was basically us — me and her parents — dealing with an event that we weren't equipped to handle, which is the person we're all in love with being very, very ill. So we knew that the general construction of [the film] could be comedic; we just had to figure out specifically how could we make it a comedy without losing the reality level of a very young woman being very ill. I went to the doctor and they decided to admit me to the hospital because my breathing was so unstable that they wanted to kind of check me out in a hospital. And by the time I got there, my breathing was so unstable, as was my heart rate, that the only thing they could do to kind of keep me safe and keep my vitals stabilized was to put me on a respirator. And you should not be on a respirator while you are conscious, so that is why they put me in a medically induced coma. Nanjiani: When I got to the hospital, Emily was in the ER and I went in and was talking to her and the nurse came in. And the nurse, first thing she said to [Emily was], "Oh, you're a very sick girl." And I was like, "What? What does that mean? She doesn't really look that sick." That was sort of the beginning of this journey. Nanjiani: Yeah, the nurse actually really encouraged us to talk to her because they said that she could hear. So we would talk to her pretty often, her parents and I. We would keep her updated and tell her what was happening in the news and what was happening with, like, celebrity gossip and stuff. Gordon: I really appreciated that. Nanjiani: We would talk to her all the time. I think I ran some jokes by her. Gordon: Did not get a good response. Gordon: I was very well aware that both Kumail and my parents were there in the room with me. I could kind of hear snatches of what they were saying. I constructed an elaborate back story for my plight that involved Kumail being sick. I thought Kumail was in a hospital and I was visiting him, so I clearly had some level of awareness of what was happening. Nanjiani: It was like this extended dream you were having. Gordon: Which, to me, I thought was only like a day or two long. I didn't really have a sense of time so much, but my brain was trying to make sense of things. I could definitely hear them — not the entire time, but I could hear them. Gordon: We got married three months after I got out of the hospital. ... There was no moment that he proposed to me, as much as we just talked about it and we're like, "We're getting married." We walked into City Hall in Chicago with four or five of our closest friends and we got married. And then we went and got brunch, stood in line — it was a Saturday, so, you know, it was a 40-minute wait. Gordon: We thought we could skip the line, because we had just gotten married, but no. I'm generalizing, but [in America], it's definitely, "Who are you? Who do you want to be? Do whatever you want!" That's sort of the American dream, right? Whereas [in Pakistan] it really is about the family unit and the community. So when I would watch [American] movies ... I didn't think I was swayed by them. I saw them as being morally inferior. I did! ... When I first saw Ferris Bueller's Day Off, I was like, He's such a bad kid. This is a bad kid. He's a bad influence on everyone. Gordon: I think what helped us partially is that we had worked together before on a couple of other projects, so we had a pretty good working relationship. I think the thing, especially for me, that I had to adjust to is that in our personal lives, I expect my husband to kind of have my back no matter what, to always support me and be lovely; and then when you go into a business meeting with a spouse, I kind of went in with that same expectation of Oh, whatever I say he should definitely agree with it and be like, "What a great idea." And what's amazing is that my co-worker Kumail has every right to disagree and think that this idea is not great and we need to tweak it, and vice versa. I think that took a little bit of adjusting for both of us to remember that the person in the room when you're working on something is not your spouse. They are your spouse, of course, but kind of emotionally they aren't. Their job is not to just support you unconditionally. So the fact that we had already set up that parameter in previous projects really, really helped us going into this. We set up some boundaries, we set up some rules around the house for when and how we can talk about work, but we mostly work really well together. We like making each other laugh. [Emily's] such a remarkable, wonderful, empathetic writer, I think it just really made me fall in love with her more. Nanjiani: I feel like it really brought us together closer partially because what we were writing about was so personal to us but also because reading someone's writing can be a very intimate experience and reading someone's rough drafts can be a very intimate experience. And I would see her typing away at something and then she would send me the file and I would read it, and it just was like a really special, intimate feeling to be like, Oh, she was just sitting there writing it and now I get to read it. Nobody else in the world has read it! I'm the first person in the entire world to read it! And she's such a remarkable, wonderful, empathetic writer. I think it just really made me fall in love with her more. Ann Marie Baldonado and Heidi Saman produced and edited the audio of this interview. Bridget Bentz, Molly Seavy-Nesper and Nicole Cohen adapted it for the Web.